Jesus and Mary College (JMC), faces an immense water shortage everyday in terms of drinking water and water in washrooms. DU Beat brings to the extent of the problem and the reasons why. The students of Jesus and Mary College (JMC), Chanakyapuri have been facing major problems due to the lack of availability of drinking water and water in washrooms. The college, undergoing continuous constructions since the past many years, has two washrooms for girls located on each floor and a water dispenser for drinking water outside those washrooms. However, the washrooms run out of water in a couple of hours in the morning everyday and so do the drinking water dispensers. “Jesus and Mary college does not have pipelines installed in the college which is why there’s always a water shortage in the college. The entire college has just one tank installed which gets exhausted within very less time,” says a second year student of Jesus and Mary College who wishes to remain anonymous. “Our college has plenty of water available, except it’s not in the taps but on the floors,” says Ananya Chopra, a second year student of Jesus and Mary College. The washrooms reek of an unbearably strong odour and a dozen sanitary infections caused by the lack of hygiene. The flush installed barely ever works, there is no provision for soaps and the floors are always wet. The inadequate washroom facilities are matched by the lack of availability of free drinking water. “Since drinking water is not available in our college, we have to go buy a bottle of water every day. Only half the washrooms are generally open and by the afternoon, there is no water available,” says Shiyona Biju, a second year student of B.Com. (Hons.) at Jesus and Mary College. “Everyday, I am faced with water-less toilet facilities. Juxtapositional to dysfunctional flush, spray and basin systems are the perennial tap-leakages, wet floors and oh-so-wet wash basins; water at unusual spaces, basically. It’s needless to say yet I’ll say that our toilets are unhygienic, smelly, and highly dysfunctional. 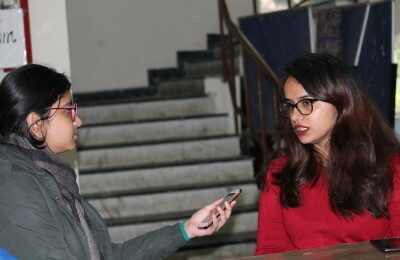 I’d really like to find out what degree of cash-crunch the college is facing to not be able to employ effective maintenance resources,” says Devanshi Jindal, a second year student of B.Com.(Hons.) at Jesus and Mary College. DU Beat tried to reach out to the administration for a comment but was unable to get a response. The students of Jesus and Mary College wait with bated breath for some form of structural or tangible change and wonder why the college exposes them to such an inadequacy of basic necessities such as drinking water and hygienic washrooms.